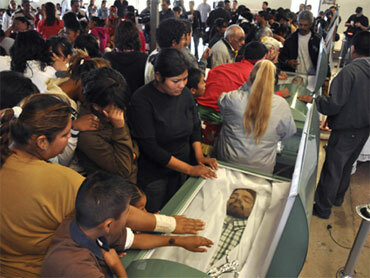 Three bystanders died in the crossfire of a shootout between gunmen, police and soldiers in northern Mexico on Sunday. The victims were a 14-year-old boy and two women aged 18 and 47, according to a statement by the prosecutors' office in northern Coahuila state. It was not clear who fired the shots that killed the bystanders, but the state attorney general's office said it was investigating and expressed condolences to the victims' families. "They are civilians who unfortunately died in the exchange of gunfire," it said, describing a running series of confrontations between police and assailants who allegedly fired shots into the air to clear bystanders from their path at one point. Mexico's army, which has taken a leading role in combating drug gangs, has come under criticism for alleged indiscriminate use of force and firing on civilians. Nineteen people were wounded in the attack on two private homes where about four dozen partygoers had gathered for a teen's birthday. On Sunday, prosecutors in northern Chihuahua state, where Ciudad Juarez is located, said they were searching for a man known only by his nickname, "The Mouse," who was apparently the target of the gunmen. Memorial services were held Sunday for some of the victims of Friday's attack, and prosecutors said that guards had been provided to protect those services. Friday's attack recalled a similar massacre in Ciudad Juarez in January, when gunmen killed 15 people at a house party.